Ask the average person on the street where do they think vanilla comes from and you are generally met with a lot of ums and ahhs, most are completely unaware that this sensational flavour comes from the seed pod of an orchid. History: The spices we know so commonly today were once more prized than gold, spices such as pepper, cinnamon, tamarind, saffron, turmeric, paprika and many more. All these were discovered in far away exotic lands, well, far away for those living in Europe. The earliest recordings of vanilla usage appears to be around 1000AD, with the Totonacea native tribe located in South Eastern Mexico being the first recorded humans to discover the benefits and flavours of the Vanilla orchids pods. Initially the vanilla that made its way back to Europe was predominately used for perfumes and related products but when the Spanish arrived in 1518 they were struck by the amazing flavour of cacao drinks flavoured with vanilla. Now it is found worldwide in every kitchen flavouring so many edible items we consume on a daily basis. 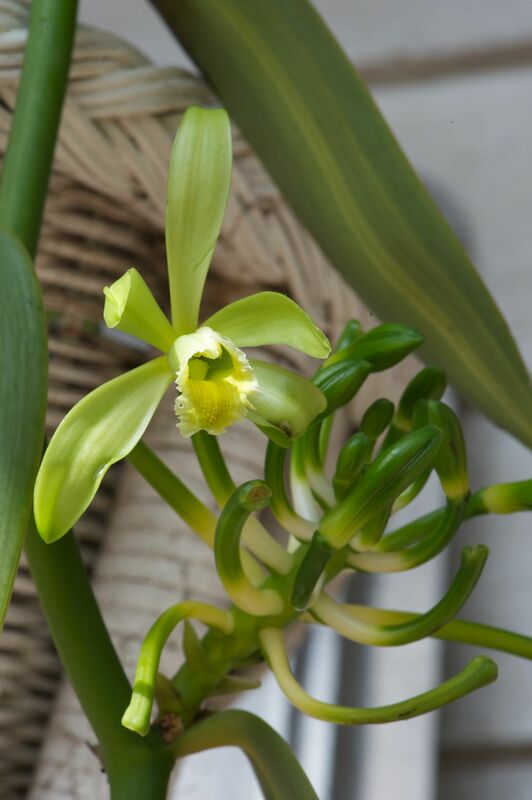 The Vanilla planifolia has the most intriguing and beautiful lime green flowers that are produced in abundance throughout the spring months. Botanical outline: The facts: Vanilla planifolia is a tropical orchid requiring pollination by a specific species of bee only located in its region of origin, Southern Mexico. It took many years for the rest of the world to work out how to artificially hand pollinate these orchid flowers so that they would produce the sought after pods. Vanilla planifolia is now successfully grown in many places around the world, such as, Indonesia, Uganda, Papua New Guinea, Tonga, and Madagascar and even in our very own Australia in the more tropical climatic zones. This is by far one the most labour intensive agricultural crops that mankind cultivates. In its place of origin it is relatively straightforward but in other locations around the world without that little native Mexican bee it is an arduous task to cultivate, pollinate and harvest. Similar to coffee the vanilla orchids pod’s flavour is affected by the environment, aspects such as, other surrounding plants and soil types and mineral content. So even though the majority of the world’s vanilla extracts come from Vanilla planifolia there has been a discovery that a mutated form of this species called Vanilla taitensis located you guessed it, in Tahiti. This new mutated species is reputed to have flavour undertones of liquorice, cherries or red wine, this has occurred because of a variance in environmental factors and growing conditions. Propagation and Culture Plants can be grown from 50cm cuttings. They must have high humidity, good rainfall in summer, a dry winter, no frost, an open free draining mix, semi shaded position and support for climbing, as I have learnt you don’t want your orchid to get out of reach so it needs to grow up a support but be able to loop and hang over, this is important so that you can reach the flowers when pollinating needs to be completed. From a cutting the vine will be around 3m metres long in about 2-3 years, in autumn it is then time to take out the growing tip to encourage the plant to flower, this will occur a few months later. Once there are flowers you need to be prepared to undertake hand pollination, check in with a local orchid breeder or vanilla bean grower on how to successfully complete this task. Keep in mind it can eventually grow to around 10 to 15 metres long. Production of the Vanilla Bean: The green fragrant waxy flowers that open during the morning will only last a few hours before dying so time is of the essence (excuse the pun) when it comes to hand pollinating. Once the flower has been pollinated the green bean-like pods will form in a few weeks and then take up to 9 months to mature. Beans in Qld plantations are harvested through the winter months. Each flower can only produce one pod. How to do they make vanilla extract and how do you cure your pods. Percolating chopped up beans in ethyl alcohol and water makes the vanilla extract. The extraction process takes around 48 hours and is kept as cool as possible so that there is minimal flavour loss. The extract then takes days to weeks to mellow, be filtered and finally bottled. Harvest time is when the beans turn from green to yellow generally in winter, here the pods then need to go through the process of being heated in the sun to sweating in airtight boxes overnight. This curing process can take quite some time, months in fact. Once complete you have your ready to go cured vanilla pods for your cooking delights. Uses/benefits: Vanilla is fabulous used in beverages, desserts, cakes, soaps, tea, sugar, salt, perfumes, cosmetics, candles, savoury dishes too. It is reputed to lower stress, promote calming, insect repelling and even has been touted to be an aphrodisiac. It can act successfully as a flavour enhancer for other flavours not just a stand out flavour on its own. Anywhere south of Brisbane may find it a challenge to grow pods but micro environments can be created and we have just had our 2nd year of flowers on my grandmothers plant here in Brisbane, we just have to master the hand pollination and reduce the height of our 5m vine! The world’s annual consumption is around 2300 tonnes. Madagascar is the largest producer at around 50% of global production. Back in 2004 Vanilla prices peaked at $500 per kilo.